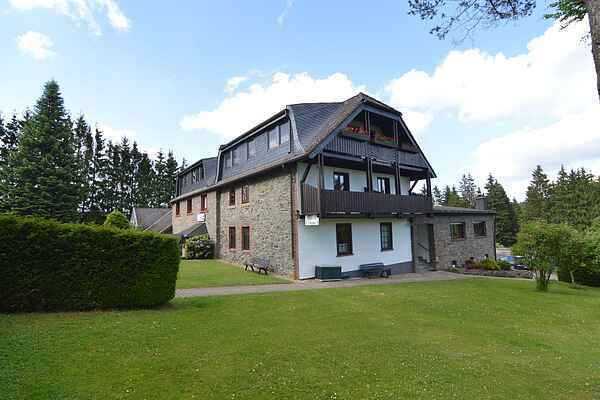 This detached, luxurious group house, (a pearl in the Eifel) is located in the middle of the nature reserve on the edge of a national park. Tours for hikers, cyclists or cross-country enthusiasts start right from the house. The house features 8 bedrooms which are all equipped with shower or bath, toilet, hair dryer and TV. In addition, the house has a breakfast/dining room, a common room, bar, fully-equipped kitchen and a sauna area. Outside, there's a barbecue area with log cabin, (campfire possible) a sunny terrace, private parking and a carport for 8 vehicles. In the village you'll find: horseback riding, bike rental (Monschau), railbiking, the Ravel route, cafe, supermarket, bakery, restaurant, bistro catering service. The house is rented to students and groups of young people only after consultation with the owners. In consultation with the owners, a different room layout can be used to make more rooms available. The location of the house is particularly attractive for guests who love nature. (Pure nature) Many hiking trails, bike and mountain bike trails start right at the house. In the village are all what is needed for the holiday a catering service, restaurants, bakery, butcher, supermarket. In the winter months, the Monschau Christmas Market (one of the most beautiful in Germany) is definitely worth a visit.